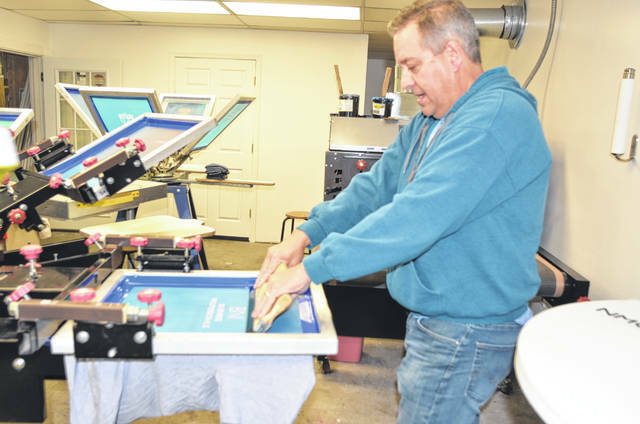 4D Imaging President and CEO Jeff Donley uses his screen press to screen print an image onto a shirt for a customer at his location on 925 N. Jameson Ave., Lima. LIMA — For the past 10 years 4D Imaging president and CEO Jeff Donley has helped companies grow their businesses through his innovative promotional products, said Donley. Since 2008 the printing and promotional advertising company on 925 N. Jameson Ave. has worked with churches and businesses in the Lima area. 4D Imaging offers printing services such as posters, multi-part forms, booklets and business cards. It also offers promotional items and apparel such as magnets, hoodies, polo shirts, T-shirts, caps and more. Donley works with suppliers across the country to purchase the items that he needs and then designs them in his in-house studio. He uses a technique called screen printing which uses mesh to transfer ink onto apparel. Businesses who are looking to purchase products should contact Donley two weeks in advance to ensure the products are ready in enough time. Once the order has been placed Donley sends his customers digital proofs which consists of a tw0-dimensional image of the desired product. Donley’s business has gone global over last 10 years and he said he is constantly busy with new orders. “Customers call and text all day from 5 a.m. to midnight,” said Donley. Businesses who are looking to purchase products should request two weeks in advance. Customer service is what he said sets his business apart from other printing and promotional companies in the Lima area. Because of this quality work and customer service Donley said he does not have to put much effort into promoting his work. Donley said that he will continue to help businesses in the Lima area prosper.